Can't We Get This Man A Car? James Robertson is a 56 year-old Detroiter who works in Rochester Hills, MI. There is a distance of 23 miles between his work and his home. He has no car - his Honda Accord died - so he takes the bus part of the way and walks the rest. "The rest" being 10 1/2 miles each way. 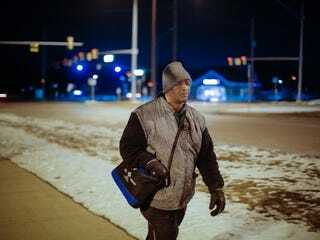 This man walks 21 miles each day to get to his job. Sometimes, people give him rides but most of the time it's just him, hoofing it to and from the bus stops (southeast Michigan has spotty mass transit). His days are long but he has a stellar attendance record because he does this every single work day. I'm not an internets techster so I know nothing of your crowdmoney kickfunders and so on but how hard could it possibly be for us to raise a few bucks and get this guy a car? He's a true American Hero and Heroes should have cars.